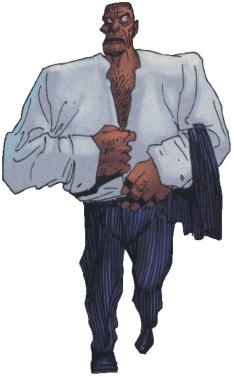 After faking his own death Hyde moved to Paris, France where he lived until Mina Murray drafted him to her League of Extraordinary Gentlemen to save England. Hyde agreed to help in the league in return for a pardon for his crimes in England [2,3]. After the league's initial mission, Hyde stayed with the league. The reason for this was not explained, but on several occations he showed that be cared about Mina Murray. When the Martians attacked Earth shortly after the league's first mission, the league was betrayed by Griffin . Griffin who didn't know that Hyde could see him tried to hide in the leagues headquarters. Here he was captured by Hyde who raped and beat him to death . Hyde died distracting the Martians, while Campion Bond launched the anthrax/streptococcus hybrid on London, which killed both Martians and the humans in the area. As Hyde noted, he died looking noble while all he wanted was to slaughter something, which he did . Skills & abilities: Edward Hyde was twice as big as big as ordinary people, which combined with his savagery made him a formidable fighter. He also had enhanced sight and smell enabling him to see the heat signature of the Invisible Man and smell if a person has been present in a room. Background notes: Jekyll and Hyde are the characters from Robert Louis Stevenson's novel "Dr. Jekyll and Mr. Hyde". Contrary to Stevenson's original story, Dr. Jekyll somehow survived in Alan Moore's version and had escaped to France. Moore's version is bigger and more savage than the original (explained in the series as Hyde being the personality with the personal drive and thus the one to evolve), but is otherwise very true to the feel of Stevenson's original character. When The League of Extraordinary Gentlemen (LXG) was released as a movie in 2003, Jekyll and Hyde was a part of the league. Jason Fleming played Henry Jekyll and Edward Hyde was made by CGI. The Strange Case of Dr. Jekyll And Mr. Hyde: Robert Louis Stevenson's original story.